Today's article is a new wishliiist ! I'm less into makeup these days. Even better, I've resume reading as much as I did in my younger days. I'd been focusing more and more on makeup which I don't think is especially better or worse, just a different passion and a different kind of art, you know ? But that's me : once I'm focused on something I just forget about everthing else. Well, lately I've finally begun and devoured the Hunger Games saga, then the first Divergent book and the first two Uglies books... I'm on it ! 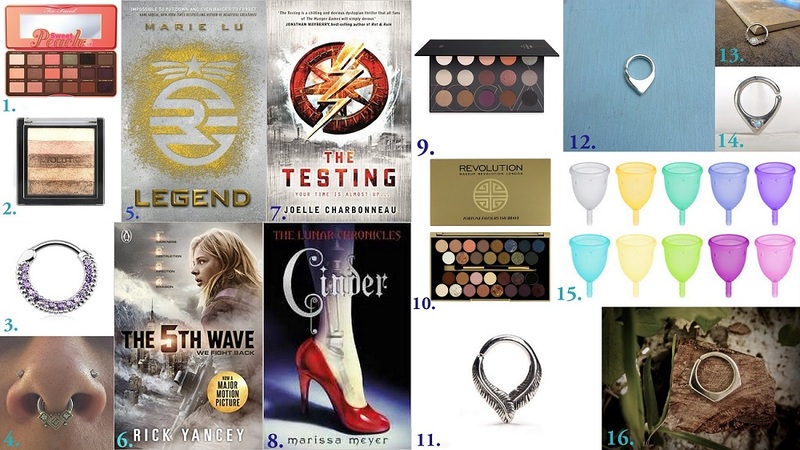 In this April wishlist, there are some makeup products, several books as well as some accessories for my beloved septum piercing. That reminds me, I'll have to publish my Crazy Factory orders as soon as they come in - as soon as I get my last 2 orders ! 1. Too Faced Sweet Peach Palette : I guess it's in many a wishlist. I didn't like the Chocolate Bon Bons palette at all but this one has these amazing eyeshadows I love. I just want it ! 2. Makeup Revolution Vivid Shimmer Brick in Radiant and Rose Gold : the Bobbi Brown dupes are £3 each. As soon as I saw them I knew I wanted them ! 4. A tribal clicker. I am in love with my septum piercing. You may be one to hate those and think they are absolutely fashionable - for a cow. I do think it brings a little something to an outfit and a general style. I love how tribal some of these piercings are and I love this one, though I can't remember where I found it. 5. Legend by Marie Lu : I buy so many dystopias on Amazon that the website just shows me exactly what I might like afterwards. The Legend series seems interesting enough since the story resembles books like Hunger Games or Divergent. 6. The 5th Wave by Rick Yancey : another Amazon suggestion I'm really interested in. 7. The Testing by Joelle Charbonneau : yet another Amazon suggestion which is a saga too. 8. As a conclusion to this first part, there's the Lunar Chronicles by Marissa Meyer I'd love to read. The first book is called Cinder and depicts the life of a kind of semi-human semi-cyborg Cinderella in the futuristic New Beijing. Wow, I'd love to read that ! 10. Yet another palette, this one is a collaboration between Makeup Revolution and BritishBeautyBlogger called Fortune Favours The Brave. I love the name and the colors and I hope it'll be available on Maquillalia soon as it's cheaper in Euro on this website. 11. A septum piercing I've loved at first sight : I love feather patterns engraved in silver, leather or wood or any natural material. This one is a must have ! 12. This is another septum piercing I'm searching for all over the Internet. It's available on Etsy but it's very expensive and costs at least €30... The fin/triangle shape is lovely. 13. Another piercing I love but I'll have to get it off an American website given it's not available on Crazy Factory ! I love gems and even though the opal may turn out to be fake, I love the style of the piercing overall ! 14. This one looks like number 12 with a gem. It's available on Etsy and you can choose between several gem colors. I love how you can buy original handmade piercings on Etsy so your style is completely unique ! 15. It seems uninvited among all these septum piercings... The menstrual cup. So you never have to wear or carry around spare tamps... It's cheap, longlasting and hygienic : I'd love to try it out for myself ! 16. My last wish in this wishlist... a last septum piercing ! I think it comes from an Etsy shop and the shape is absolutely different from anything I've ever seen especially on Instagram. But I love how different it looks ! I'm curious about what you're on this month : what are your wishes and yearnings ? Leave me a comment and/or a link of your article below !